Battery and meters are two widely used technologies, yet no one stops to think how they work. They determine our future. They dictate how we communicate, commute, adopt green technologies, and measure. Imagine the trauma of pushing your snazzy car everytime you started on a journey, or charging your new cell phone after each call. And what would the world be without the means to calculate the amount of resources used? A tremor ran through the cutting- edge electric car industry last month. Mathieu Tenenbaum, working with French automaker Renault, was just another faceless name till then. But one espionage story that hit the newsstands made him infamous in a single stroke. Tenenbaum was sacked for spying. Not that he had leaked a closely guarded nuclear secret. It was a mere battery that unleashed high drama in the fiercely competitive world of electric cars. According to newspaper reports, the French intelligence agencies pointed towards China charging it with stealing the battery technology. Beijing was quick to deny it. Renault did not reveal what had been leaked, but did say it was a huge relief for the company that technical details of its battery technology were safe. Renault and its Japanese affiliate Nissan are spending a whopping US $5 billion to develop electric vehicles that run on batteries. Not surprising then that the auto major had panicked fearing that the company’s crucial and secret details, vital for its growth, had been let out. Renault-Nissan has staked its future on the success of battery and its ability to power a vehicle. The joint venture’s CEO Carlos Ghosn has claimed that by 2020, zero-emission, battery-powered vehicles will comprise 10 per cent of the global car market. The espionage story has laid bare the fact that battery technology in the electric car industry has the potential to pay huge dividends. Just a month before the story broke, Nissan launched its electric car Leaf. Powered by a 24-kilowatt per hour battery pack, it claims to run about 160 km after being charged once with a top speed of about 145 km per hour. Leaf has been voted the 2011 European Car of the Year, an award established in 1964 by a collective of automobile magazines. In the United States, after accounting for subsidy, it costs around $25,000. But this is expensive compared to petrol vehicles. That is why even a small breakthrough in the technology will hugely benefit the industry. The global battery market, valued at US $100 billion, is projected to grow at 4.8 per cent by 2014, according to Freedonia Group, a publisher of market research reports. Batteries today don’t just power vehicles, but dictate how we communicate, read, listen to music, commute, back up our data, adopt green technologies and overcome power cuts. 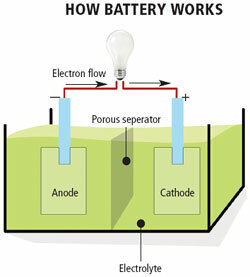 A battery comprises two electric conductors (electrodes) connected by an electrolyte, the medium for transfer of ions. This produces a flow of current converting chemical energy to electrical power. There are three most common families of batteries—lead-acid, lithium and nickel. 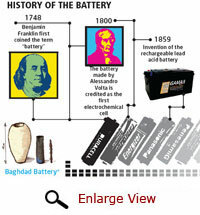 Lead-acid is the oldest rechargeable battery and promises to remain in the market for years to come. Its cell contains electrodes of elemental lead and lead oxide in an electrolyte of dissolved sulphuric acid. This battery is heavy because lead has low electrochemical potential. It is, therefore, used mostly in bulky or stationary devices. At the forefront of battery revolution is lithium-ion 18650, which makes possible a casing of just 18 mm diameter and 65 mm length. Being the lightest metal and the least dense solid element, lithium makes the battery pack portable. It is used in cell phones and laptops. Many companies are now trying it out in electric cars. Nickel metal hydride has been used in electric cars such as Toyota Prius, but it is double the weight of a lithium battery. Nickel cadmium, once used to power cell phones and laptops, has been replaced by lithium-ion after concern was raised over cadmium’s toxicity. 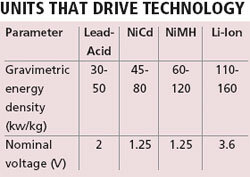 Lead-acid market in India is valued at Rs 20,000 crore and is growing at 15 to 20 per cent per year. This is the strongest sales growth of any national market. Invented by French physicist Gaston Plante in 1859 (see ‘History of the battery’), the lead-acid battery is here to stay. “It will continue to dominate for the next 20 years,” said L Pugazenthy, executive director of the India Lead Zinc Development Association. Used in heavy duty vehicles such as cars, tractors and forklifts, it is now common in households. Power cuts have made inverters and battery backup a lucrative industry. It continues to provide power to critical operations like air-traffic control towers, hospitals, rail- road crossings, military installations, submarines and weapons systems. Telephone connectivity, too, is uninterrupted because telecom companies use lead-acid battery as back-up. “It would be very difficult to replace lead-acid as it has one basic advantage— low cost. The process of refine, reuse and recycle is also fairly simple,” said A Chakrabarty, battery expert and former technical head of Exide, India’s largest battery maker. Growth of the renewable energy sector also depends on this chemistry. But the sun does not shine at all times, neither does the wind blow enough. Therefore, battery for this sector must provide power for at least five days, or 120 hours. For this, thicker electrodes are used since they get eaten away during charge cycles. “From a cost-performance standpoint, the lead-acid battery is a good choice for storage of renewable energy,” said Jerome Cole of International Lead Zinc Research Organisation, a nonprofit in the US. Nickel metal hydride battery packs could cost four times more than leadacid, said P C Pant, scientist in-charge of battery projects at the Ministry of New and Renewable Energy (MNRE). In remote areas, off-grid projects require user-friendly and established technologies. Projects that directly feed the grid do not need batteries. Before 2010, India’s demand for lead-acid batteries with off-grid solar projects was about 0.3 million a year. The demand increased after the Jawaharlal Nehru National Solar Mission was mandated to generate 2,000 MW off-grid electricity by 2022. In the first phase, which ends in 2013, there must be 200 MW of off-grid generation. This will increase the annual demand to more than 1.5 million battery packs, Pant said. Big players like Andhra Pradesh-based Aamara Raja, who were not active in this sector, are making an aggressive entry. All off-grid photovoltaic projects need inverters to convert direct current into alternate current. Companies like Microtek and Su-kam that manufacture inverters have, therefore, diversified into providing batteries for solar applications. However, lead-acid battery has the drawback of being bulky and heavy. 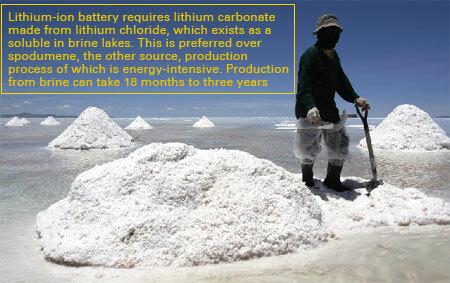 This is the reason companies are experimenting with lithium-ion. Producing maximum power with minimum battery weight is the industry’s main challenge. Cracking this code will prove to be a huge breakthrough that will help replace or minimise use of petrol and diesel devices with a batterypowered alternative. The unit, kilowatt per kilogramme (KW/KG), is the most important parameter in the battery world. Also called gravimetric energy density, this unit is used to compare different battery packs (see ‘Units that drive technology’). Companies are now competing to develop safe battery packs that can run devices longer on one charge over thousands of charge-discharge cycles. Japanese major Sony was the first to commercialise lithium-ion battery, much lighter than lead-acid. It used carbon material on the anode. Today, graphite is a popular choice for anode. The way ahead for lithiumion battery lies in experimenting further with different electrodes. Just about five years ago, cell phones or laptops powered by lithium doubled as bombs. There were instances of gizmos being blown into pieces. 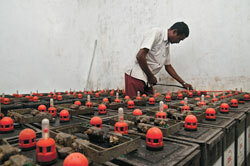 Companies recalled their batteries, which cost them millions of rupees. Now, there are control systems for monitoring and protective circuiting. Technology has definitely evolved, but will it crack the crucial code? If battery is the future of energy storage, the most efficient pack is lithium-based as it has the best electro- chemical potential. Just one lithium-ion battery can efficiently run a hi-tech cellular phone. It has replaced the nickel-based cell phone that is bulkier and requires frequent charging. Nickel battery also suffers from memory loss. When charged repeatedly after partial discharge, it forgets its usage capacity. A lithium battery does not suffer from amnesia. Market research has predicted that demand for lithium will be spurred by the popularity of portable electronic devices like cell phones, gaming systems and laptops. Because of its high energy density, it is the leading choice of battery for electric vehicle manufacturers. India got its first battery car, Reva, in 2001. Powered by lead-acid, it has its drawbacks. The car has limited driving range because of its weight. Its battery takes long to recharge. The company is now experimenting on 100 cars powered by lithium-ion. They may be in the market soon. Lithium-ion chemistry has emerged as a leading solution to electric vehicle batteries. Its performance is seen best in roadster Tesla (see ‘Tesla’s lithium leap’). On kilowatt basis, lithium-ion batteries cost three to five times those of competing chemistries. “The high cost derives from the raw material, cell packaging and need for special manufacturing facilities,” said R V Alagesan, scientist at the Central Electrochemical Research institute in Tamil Nadu. Lithium is also known to be inherently unstable, especially while charging. It has the potential of thermal runaway— temperature quickly rises to the melting point of metallic lithium and causes exothermic reaction. To solve this, research was conducted in the US in 1980s, substituting metallic lithium with electrodes containing lithium-ion. If lithium is the future oil, South America may soon become the next West Asia. 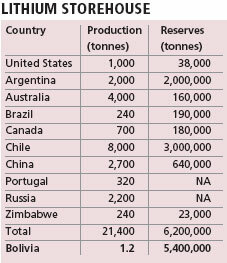 The continent dominates lithium production, with Chile and Argentina accounting for 10,000 tonnes of the global production of 21,400 tonnes (see ‘Lithium storehouse’). With an estimated 5.4 million tonnes, Bolivia is sitting on half of the lithium reserves and an even higher percentage of salt reserves, a source considered ideal for batteries. Salar de Uyuni, the world’s largest salt flat in Bolivia, has attracted car manufacturers and lithium miners. But unlike Argentina and Chile, the Bolivians are playing hard to get. The country’s mines minister Luiz Alberto Echazu has said companies wanting to work on the salt pan must develop industries there. Bolivian president Evo Morales also made it clear that his country will not export raw material forever. He wants the manufacturing base of lithium-ion battery and electric car to shift to Bolivia. Global demand for lithium will not increase until millions of electric vehicles are produced each year. It is understood that 400 gramme of lithium is required to produce a battery pack with one KWH output. To exhaust the 2010 projection of 9.9 million tonne reserves, 25 billion KWH battery packs could today power more than a billion electric cars, each with a 24 KWH battery pack similar to that of Nissan Leaf. Bolivia is clearly the destination of the future. Battery technology has been making rapid strides. Even the good old leadacid chemistry has improved drastically. Some three decades ago, lead-acid packs were available mostly in hard rubber containers and required frequent addition of distilled water. “Now they come in poly propylene containers and are almost maintenance-free,” said V K Aggarwal, chairperson of Supreme Batteries. Life of a battery has also increased from 12 to 18 months, to 36 to 42 months, and its capacity is twice per unit of lead used. In its effort to bring out thin batteries, Apple introduced lithium-ion polymer in its new generation portable devices. Polymer, along with a thin layer of gel, works as an electrolyte making the battery an unbelievable one millimetre thin. It comes packed in a pouch replacing the traditional metallic cylinder hard shell with heat-sealable foils. Scientists at Stanford University are working to enhance the lithium-ion technology. The research seeks to improve the anode’s capacity by replacing carbon with silicon. This can hold 10 times more lithium. Another option, still being explored, is the supercapacitor. It can store electric energy when disconnected from the charging circuit and can be charged over and over again. But instead of working as a replacement for battery, it is used to enhance one another. It is true that research on battery chemistry will take long to transfer into actual application. But it is equally true that the dream of an energy-secure and environment-friendly future can be realised only through the battery. Life has no free lunches. More so, when a rapidly growing population wants to somehow bite into the limited pie of resources. This mad scramble has made measurement of who uses how much all the more vital. It is for this reason that utility managers are investing in meters that give precise readings. The focus is on improved electricity and water meters. Finding solutions to reduce errors will help utilities avoid the vicious cycle of poor service and low revenue generation. Not long ago, power utility companies were a harried lot as most consumers tampered with meters. If tilted in a particular direction, the meter would stop reading. Resting a magnet on top would also tinker with the readings. The utilities incurred 40 to 50 per cent of revenue loss due to this. This was the electromechanical meter that works on an aluminium disc and two coils. The coils produce tiny currents in the disc which rotates. But giving discomfort to the consumer is its reading that shows a two-per cent error. If the meter is tampered with, utility managers have no way to prove it since the meter cannot register past data. To counter this and check tampering, the electromagnetic meter was introduced, said Pradip Ranjan Dutt, Indian representative of Landis and Gyr, the largest global player in electricity metering. Its reading shows less than one per cent error, which meets the standard set by the Central Energy Regulatory Commission. In fact, any digital signal processing system gives superior accuracy. Its memory also helps give past details. An in-built deterrent checks tampering by use of magnets. Instead of running slow, the magnet speeds up the meter. Electromagnetic meters are also far more sensitive. They read even the television sets put on stand-by mode and the zero-Watt bulbs used at night. “It can record very low current such as 10 milli ampere,” said V N Nanda Kumar, additional director with Bengalurubased Central Power Research Institute, an autonomous testing facility under the Union power ministry. Delhi phased out the antiquated meters in 2002 and gave electromagnetic meters to 2.72 million households. The new meters are being installed across India. For long, water meters have been a low priority area. Paying for a natural resource like water was not acceptable to many in a welfare state like India. Meter technology evolved after it was realised that water is a limited resource and its misuse must be checked. “People often get wrong bills. So, it is in their interest that they get a more precise reading,” said Neville Bhasin, programme coordinator of Krohne Marshall, market leader in flow meters. Earlier, most Indian homes had Positive Displacement Meters. The volume of water used was measured by displacement of components in the meter. In 2005, Delhi Jal Board approved the Inferential Meter. Its mechanism does not involve any contact with water. The water drives a turbine and the reading is proportionate to the volume passed through it. It is preferred primarily because it cannot be tampered with. This rust-free meter is air-tight which does not allow moisture that could make the dial hazy and, therefore, unreadable. But mechanical meters are prone to inaccuracies that creep in when silt and suspended particles start clogging it. Their moving parts also obstruct the flow resulting in a pressure drop of about 3.5 kg per square cm, said Bhasin. To account for the loss in pressure, a utility manager would have to spend Rs 13.5 lakh in pumping for a bulk meter with flow rate of 2 million litres per hour. According to the Central Public Health Environmental Engineering Organisation, mechanical meters show an error of two to four per cent. Opposed to this, electromagnetic meters can be erroneous by just 0.5 per cent. These meters obtain the flow velocity by measuring changes of voltage with water passing through a magnetic field. Here, kinetic energy is converted to electromagnetic signals. But the electromagnetic meter’s precision does not come cheap. For instance, water meter for a 15 mm pipe would cost Rs 50,000. 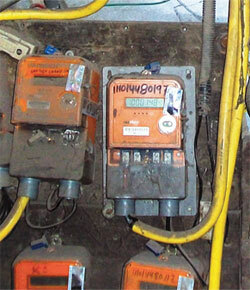 In Delhi, the nine approved mechanical meter manufacturers price their meters between Rs 750 and Rs 1,350. It is for this reason that electromagnetic meters are not advocated for use in households. In bulk usage, it pays huge dividends. In Indore, 20 per cent people consume 80 per cent of the water supplied. To optimise revenue generation, accuracy was prioritised. Krohne Marshall was assigned the task of installing electromagnetic meters. The company invested a whopping Rs 110 lakh. Consumers did not get inflated bills and all of them paid up. Revenue increased by Rs 84 lakh annually. Measurement of the Western Railways’ water consumption paid dividends with the bills increasing by Rs 15 lakh each year since February 2008. Metering is beneficial to the consumer. A tariff structure based on volume consumed can promote equity and target subsidy, said Sriniwas Chary, service delivery strategist affiliated with the Administrative Staff College of India. The way ahead lies in smart metering with communication. These digital displayed meters relay information to a central server through the internet or a wireless network. Radio frequency networks pick up meter readings on a laptop within a driving radius. Seventy per cent of the investment on smart meters can be recovered through savings on operational cost, including doing away with meter readers, according to the California Public Utilities Commission. 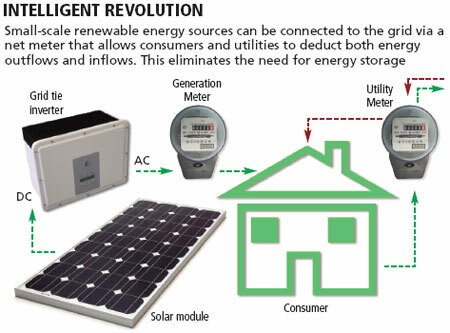 Smart meters can record consumption in short intervals, each hour or even less. This helps resource managers and consumers manage their demand. They also have sensors that can report opening of the meter cover, magnetic anomalies, extra clock setting and inverted installation. But smart meters are not without controversy, with consumers in California alleging they were logging more units. An independent study in September 2010, however, found that they gave correct readings. Meters are usually installed in corners of houses making reading difficult. Master Meter Inc, a North American manufacturer, has taken reading to a superior level. It has military-inspired drones that can help utility managers take readings from the sky. Weighing less than a kilogramme, the carbon fibre drone is fitted with a receiver that can collect water, gas and electric meter readings all at one go while passing overhead. It is self-guided with the aid of a Global Positioning System. It is battery operated and can fly for 90 minutes per charge. These meters are being used in the US and Israel. All meters can be tampered with, and all can be fixed. Unless technology evolves, regulation would remain weak. battery is necessary in future for polution free environment. Thank you. Very informative article. I hope one can trust all the information and facts to be genuine in this day and age of so much doubt on reporting. I am big fan of your article Mr. Bharat. Good correlation and full of information about battery and their role to improve local environment. Other aspect that you can also light on like removing batteries from the municipal solid waste stream and into recycling reduces the toxic impacts, battery recycling is not wholly environmentally benign. Few scientists explain that there are significant transportation and related fuel costs to get batteries to recycling facilities and properly sorted into chemically related classes of materials. Battery recycling processes also require significant amounts of energy. According to them, it takes 6 to 10 times more energy to reclaim metals from batteries than it would take to obtain those same metals by other means. Similarly, Some batteries contain toxic metals such as cadmium and mercury, lead and lithium, which become hazardous waste and pose threats to health and the environment if improperly disposed. Manufacturers and scientists are working continuously to reduce the environmental impact of batteries by producing designs that are more recyclable and contain fewer toxic materials. As published the potential advantages of plug-in electric hybrid vehicles, scientists at Europe and U.S. Department of Energy noted that both intensive energy requirements and sulfur dioxide production are environmental impacts of battery production and recycling. Through Argonne National Laboratory, the U.S. Department of Energy is investigating these and other environmental safety issues related to battery recycling. My question is where we stand and what is our initiative (Adopt technology, environmental friendly batteries, star rating etc. that people should think before they buy) to address this problem. Keep up it as usual. @ Gajendran: Indeed, battery is essential in the uptake of renewables, electric/hybrid vehicles. They do however as Jay points out have a footprint of their own. Safe to assume that the benefits outweigh this. @ Rishi: It is for the reader that we do the research and legwork that we do; information and facts to the best of my knowledge. @ Jay: Thanks, yes, recycling was beyond the scope of the article. India as you are well aware is dominated by the lead acid chemistry. 1 tonne of battery materials contain 560-580 kilogrammes of Lead, of which more than 90 per cent can be recycled. An Italian recycling firm company official that I met said that in Europe they recover this for Euro 180. Lead, and I stand to be corrected costs upwards of Rs 100 per kilo. You can also recover 500 kilograms of polypropylene in the recycling process. Of the total lead consumption in 1960, 27.3 per cent was used in batteries. Today this has increased to 80 per cent; usage in paints and fuels have reduced considerably. In the western world the use of primary lead is decreasing and secondary lead use is increasing due to sufficient recycling facilities. Natural resources for lead are limited and mining is a costlier proposition, according to the ILZDA. Our understanding is that researchers are trying to develop alternatives. But until a more affordable chemistry is introduced, Lead-acid will dominate for at least two decades or more. The Chinese company BYD (www.byd.com) is working towards some new battery technology for cars. The sucess of the Battery powered car will depend on the charging times for the battery,the size and portability of the battery and recharging logistics. Since charging times are high, one can drive in to a "fuel" station, drop your existing battery and pick up a pre charged one. Thanks for some other great article. Where else may anybody get that kind of info in such an ideal way of writing? pl let me know weather any lithium ion battery recycling technology is available, if yes who are manufacturing and supping lithium ion recycling plant and set a such plant is viable.